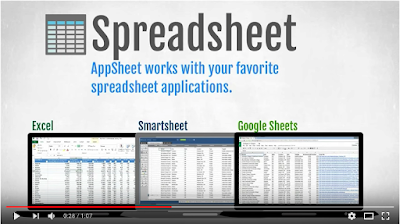 AppSheet is a good web tool that allows you to create custom Android and iPad apps based on data from a Google document ( using AppSheet Google Docs add-on) or from a spreadsheet created by one of the supported applications (Excel, Smartsheet, and Google Sheets). No coding is required, the process is simple and easy to use. First, you need to head over to Appsheet.com and connect your stored data. You can access Google Docs or spreadsheets right from within Appsheet and then using the App Editor you will be able to custimize your app the way you want. You can add a wide vareity of features to your app including: GPS and maps, charts, image capture, signature capture, barcode scanner, offline access, email notifications and many more. When you are finished working on your app you can share it with others and use it on various devices (phones, tablets and web browsers). 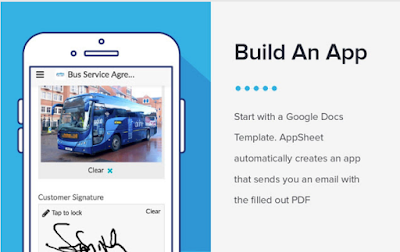 Apps created by Appsheet are designed to function offline and all data captured by your app will be saved to the cloud storage platform of your choice (e.g., Google Drive, Box, OneDrive, Dropbox etc). AppSheet offers different pricing plans, apps meant for personal use are free to create. You can also try Prototype for free which allows you to ‘use all the data sources and platform features for up to 10 app-users while your app is in testing mode’. Other plans are for pro users. Click here to see some sample apps.